Jeep fans who have been waiting with baited breath for the announcement of when the all-new 2018 Wrangler will go official now have a timeframe. The new Wrangler will launch in November. That’s not an exact date, but November is only weeks away meaning it could happen very soon. 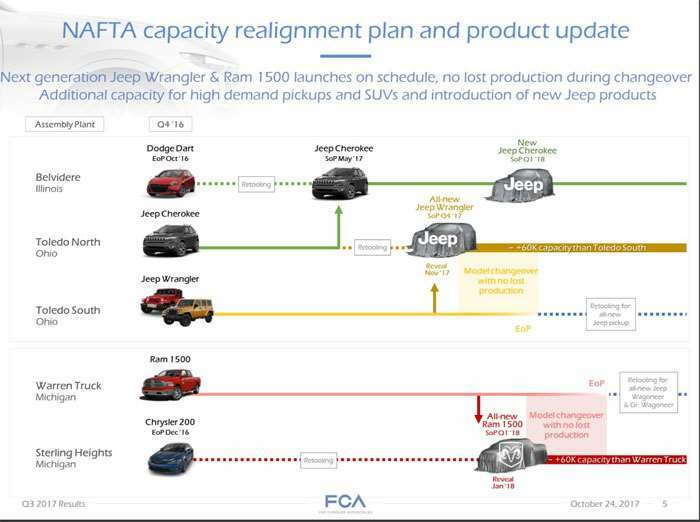 Jeep also points out that no production loss will be had during the change from the current Wrangler model to the new Wrangler. Along with details on the new Wrangler, some other products were also tipped on the calendar. An all new RAM 1500 will be debuting in Q1 of 2018 and no lost production on switch over is again promised. A new Jeep Cherokee is also tipped for Q1 2018. In that same early 2018 timeframe Jeep will also begin retooling for the new Jeep truck.